If you want to cook rice with any regularity, I recommend you get a nice rice cooker. Don't buy that cheap rice cooker with the glass lid that's $15 at Walmart. It's not really any better than using a pot on the stove. Get a real rice cooker. With an advanced rice cooker, all you have to do is measure out x cups of rice into the rice cooker's pot, rinse the rice, and fill up the pot with water up to the line number that matches the number of cups of rice you're cooking. 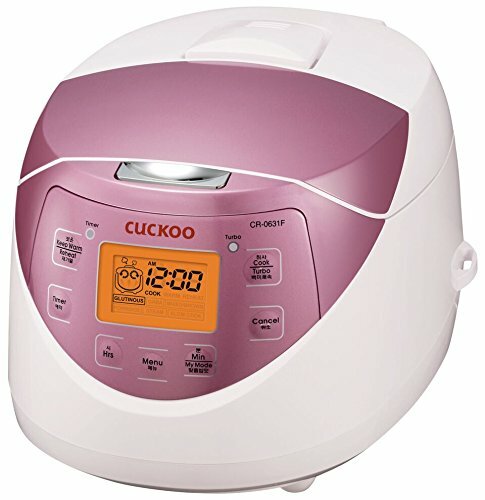 One feature that I think is specific to the Cuckoo line of rice cookers is that it keeps your rice warm after it finishes cooking. This means that you can make rice on Sunday and continue to eat warm, delicious rice Monday and Tuesday too. I'm not sure how long the rice cooker will keep the rice warm before it decides the rice needs to be thrown away. but it's definitely at least a couple days. This rice cooker indicates how long the rice has been kept warm on its display. In the picture below you can see that the rice in my rice cooker was finished cooking 62 hours ago. How does 62 hour old rice taste? Pretty much the same as fresh rice when it comes out of a Cuckoo. There's another cool features on this rice cooker. It has a clock and a timer. The timer lets you schedule when you want your rice to be ready. This is really handy. You can fill your rice cooker with rice and water at night and tell it you want your rice to be finished cooking at 8 am for breakfast. When you do this, your rice will be able to soak overnight and give you much better results. This rice cooker also has different modes for white rice and brown rice and a couple other types of rice I have never heard of before. Basically, if you want to cook rice in a different style, this rice cooker probably has you covered. The buttons and programming for this rice cooker are a little hard to figure out. There's a turbo button that supposedly lets you cook your rice more quickly, but after a couple years I still haven't figured out how to use that feature. Cuckoo rice cookers keep your ric warm and fresh for days after it's done cooking. The timer feature lets you schedule when you want your rice to be finished cooking. It's also easy to switch between cooking white rice and brown rice. Making rice with this rice cooker is super easy as long as you stick to the basic functions. Overall, I give this rice cooker a rating of 4 out of 5. If I could figure out how to use the turbo cooking mode, it would be a 5 out of 5. It's reliable and has provided my wife and I with warm, fresh, delicious rice every day for the past two years or so without incident.